The home has 8 comfy bedrooms and most have their own personal bathrooms! 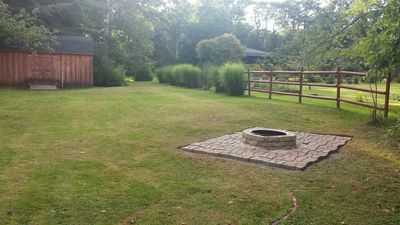 Two working fireplaces and large eat-in kitchen with vintage commercial Garland range and a covered, outdoor hot tub. 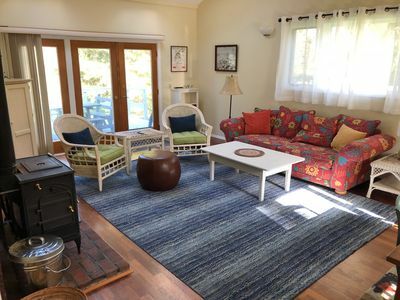 Come get toasty by the fire or soak in the hot tub after a long day or skiing, hiking, boating, swimming, antiquing and exploring! 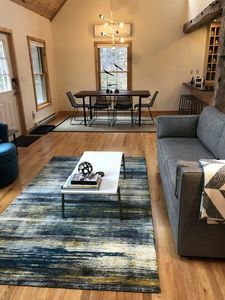 During your stay, you will have access to entire main house and wraparound deck, along with surrounding grounds and parking. The barn is available for approved events and will be subject to a rental charge (inquire within). 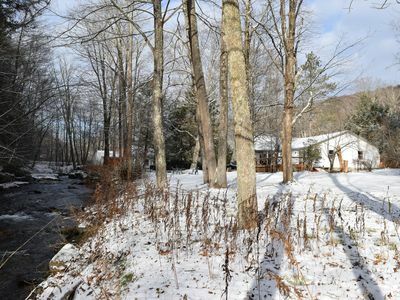 There is a separate and private cottage on the property that will be available to accommodate other guests (or us) to stay in beginning Summer 2019. 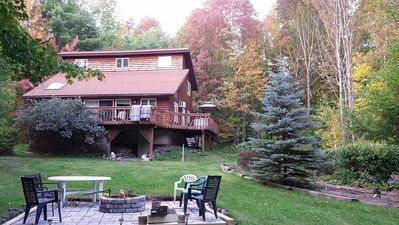 Those staying in cottage do not have access to main house & facilities (hot tub, main house deck) without prior authorization. 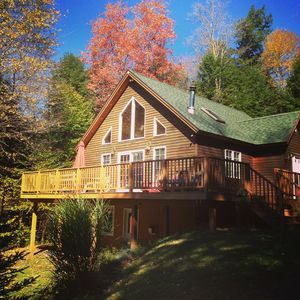 If you are interested in booking the cottage, please reach out for availability! We have a local property manager that is readily available for any potential needs that may arise. 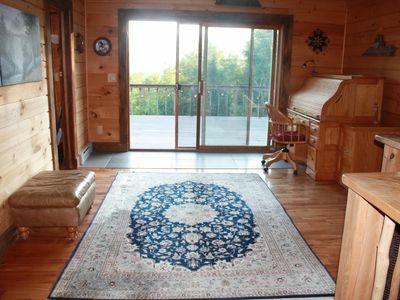 Occasionally, we may stay in private and separate cottage on the property with our two pups. We will always be respectful of your privacy and space. We will also be available by phone for any requests, needs or questions that you may have! There is a guide in the house with suggestions to eat, drink, see & do. The house is set up to comfortably accommodate 20ppl maximum. We love dogs! So, well-behaved dogs are welcome. 2 dogs max. The add'l fee will be $25 per dog, per night booked. 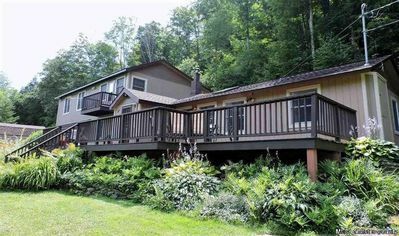 The home is located in the woods on a secluded property; potential for wildlife sighting is quite possible! This a very large, older home so temps can vary throughout. 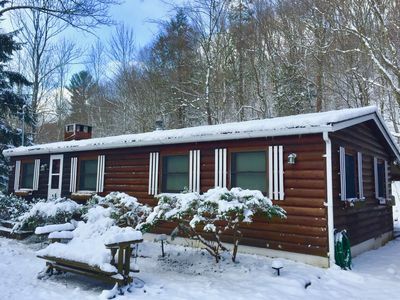 During colder weather, small areas of the of home stay warmer (bedrooms, kitchen) than larger open areas (formal dining room), so sweaters and comfy slippers may be needed for some folks. There are supplemental heating sources for your comfort: fireplaces, floor heaters, wall heaters and throws. Check-out is 11am SHARP and Check-in is between 4pm - 10pm. Please understand that the house requires the entire time in between to clean & prepare for the next set of guests. If you would like to arrange an early check-in or late check-out please let us know beforehand so we can try and make arrangements ahead of time, if possible. 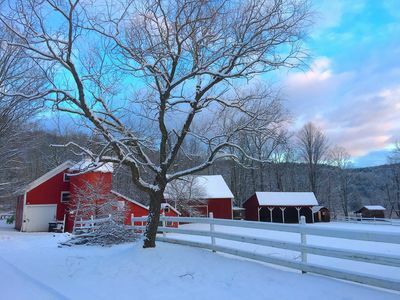 There is so much to do in this part of the Catskills in every season! 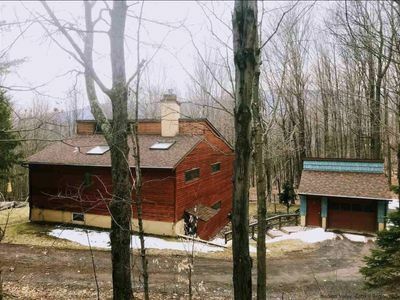 Pine Hill is a Hamlet in Shandaken in the heart of the Catskills, approx 2.5hr drive from midtown NYC. 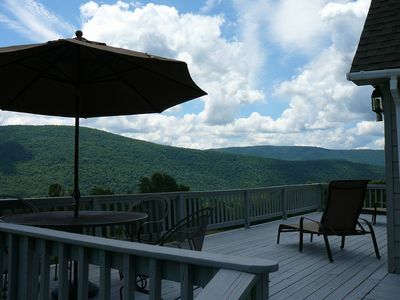 We are 5 mins away from Belleayre Ski Resort and about 30 mins from Hunter, Plattekill & Windham. Belleayre Beach at Pine Hill Lake is a 3 min drive with swimming, kayaking, stand up paddle boarding and more. There are endless hiking trails in the area. Here below is a copy of our house guide of to eat/drink/see & do in the area! Sweet Sue’s - yum-mazing buttermilk pancakes, waffles & more in Phoenicia. 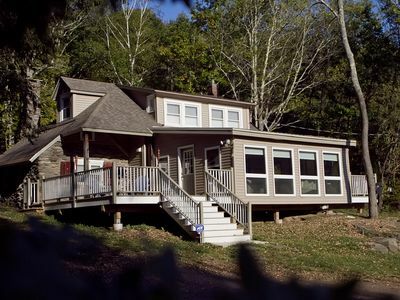 Peekamoose - upscale locally sourced fare in beautifully restored farmhouse. Pine Hill Arms - closest restaurant to the house with inviting bar & dining with warming, creative cuisine. 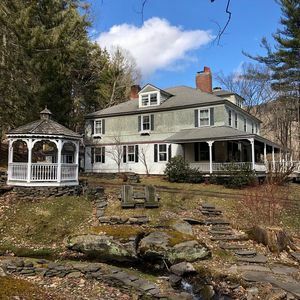 Binnekill Tavern - great for sit down gathering, revived with new ownership. Mountain comfort food. Brushland Eating - we can’t wait to check this place out. 30 min drive but menu looks amazing, call ahead for reservations! 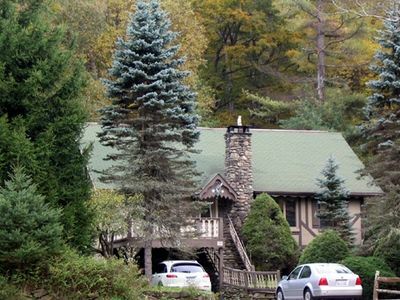 Foxfire Mountain House - relaxed, bohemian vibed restaurant in 100yr old Inn. Sophisticated fare. Woodstock Brewing - great beer, burger and vibes! In Phoenicia. Pup friendly. Belleayre Beach at Pine Hill Lake- spacious lake with beachfront offering kayaks, stand-up paddleboard, grills, volleyball & basketball courts. 5 mins from house. Big Indian Wilderness - local forest preserve for hiking, snowshoeing, hunting etc. 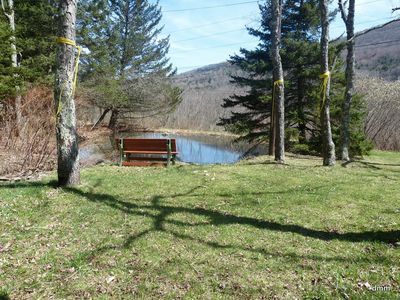 Esopus Creel - this is where it’s at for Fly Fishing on the Esopus. 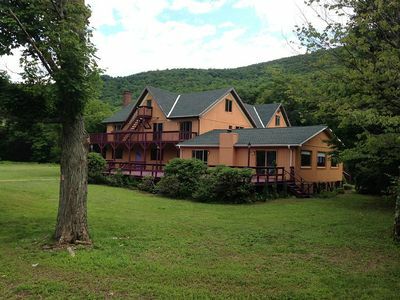 Catskills Yoga House - Breathe, Flow, Be. A range of classes and varied schedule offered. Belleayre Ski Resort - Ski resort 5 mins from the house. Wide mountain with varied trails. Hunter Ski Resort - Terrain for all levels. Approx 35 mins from house. 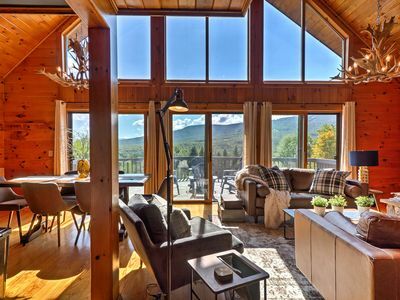 Windham Ski Resort - large resort in a charming town. 54 trails. Plattekill Ski Resort - family mountain open on weekends. They do snow tubing! Kaaterskill Falls - fantastic hiking with the highest cascading waterfall in NY. 45 mins away. The Ark Bowl - Retro-bowling at its finest. Open only two days a week: Weds & Sat. 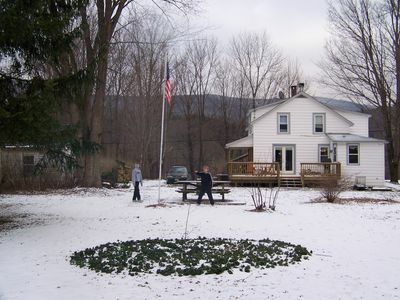 Shandaken Historical Museum - very close to house with a wealth of Catskill history. Morton Memorial Library - Original owner of this home was benefactor to the town of Pine Hill. The library offers a schedule a mixed classes for adults and children. Delaware & Ulster Road Rail Museum - excursion train that combines railroad nostalgia with scenic ride. Howe Caverns - take a day trip and go spelunking! largest show cave in the Northeast. Emerson Kaleidoscope - home of the world’s largest kaleidoscope. Unique sort of thing to do. Rail Explorers - go for a scenic rail ride along the Esopus creek! Fruition Chocolate Works - Award winning, eco-friendly chocolateria made by a husband & wife team. Antiques at Rick’s Barn - Real deal collectibles. Will ship. Blue Barn Marketplace - mix of dealers, artisans and designers. Belleayre Plaza - Gas, beer & liquor, deli and basic goods. Tremper Hill Farmers - excellent local offerings to curate a meal. Open until 11pm on Fridays. Two Stones Farm & Creamery - in Fleischmanns. Limited hours but great stuff if you can make it over! Drugstore/Pharmacy - CVS is in Margaretville. Next to Freshtown. Getting around by car is recommended, but you can walk to downtown Pine Hill. No car? Trailways of NY Bus Line drops you off at Belleayre Plaza, a 3 min drive from house (.08 miles). The bus only takes 3 hrs & 15 min to and from Port Authority. 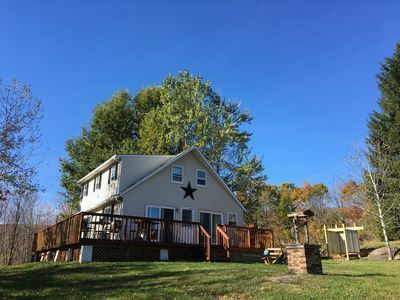 Cheerful 3 BR Country Cabin On 5 Acres - Secluded yet close to town! 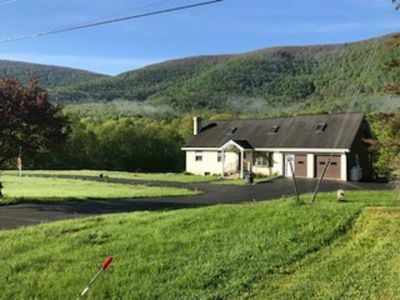 Mountain Views and Privacy in Catskill Park!